A simple soup is a kind of basic food, which should be in the Arsenal of every housewife skills and preferably be always present in her refrigerator. This soup is quick and easy to prepare several days ahead, then it is easy to reheat in a hurry or if there is a desire to create on its basis any culinary masterpiece. Bay leaf – 1 piece. Pour water into the pan, throw the meat, put the pan on the stove over high heat. When the water boils, reduce heat to medium and remove foam. Wash and peel the carrots, peel the onion and send them to the same place in the bowl with the meat stew. Simmer the contents of the pan depending on the type of meat – from forty minutes to one and a half hours. Beef and a half hours, pork – an hour and a half chicken hours fish – 40 minutes. Periodically remove the formed during boiling foam. 15 minutes before readiness put in a pan Bay leaf and pepper. Salt. The resulting soup is ready serve as a separate dish. If you wish, season it with herbs, garnish with a half-boiled egg, add croutons – all this can be done together or separately (and, thus, you have a few different soups). Or pour the broth in an airtight, with the possibility of creating a vacuum container and refrigerate. This simple soup can be stored for a few days, based on it is then easily to do more complex delicious soupwith variety of ingredients. 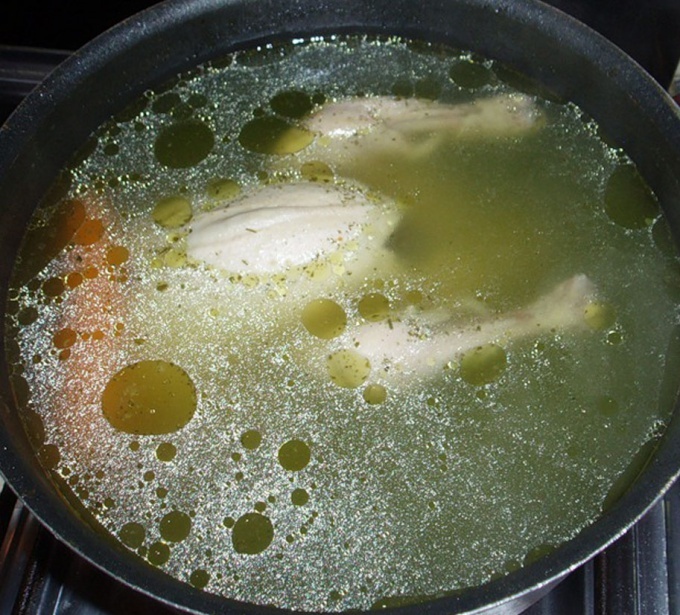 Do not add water to the soup in the cooking process, it will greatly impair its palatability. Do not go overboard with salt, especially if you plan to use a simple soup as the basis for cooking more complex recipes. Do not use bouillon cubes and seasoning with a complex chemical composition unnatural. Dyes, preservatives and flavor enhancers (in particular, glutamate sodium) is not useful, moreover - is harmful. When the soup is ready, take out carrots and onions, keep the broth should be without them. Simmer the soup over medium heat. A strong fire will make the broth cloudy, and the weak not rich. The transparency of the broth gives the dressing in the form of carrots and onions. Delicious desserts can be prepared in a few minutes. Even a novice cook. It is easy to learn how to make a cocktail, cream or cooking delicate jelly. It's an old Russian folk dish still enjoy doing and drink a lot. Jelly is very useful. Fruit and berries – give the body the necessary vitamins and milk – replenish the reserves of calcium. - 2 tablespoons of starch. Stir in the sugar into the milk and place the saucepan on a small fire. Dissolve the starch with water and egg yolks. When the milk starts to boil, stirring, pour in egg mixture. Simmer for a minute so the egg yolks don't curdle. Place the pot in a container of cold water, cool. At this time the jelly should occasionally stir to a uniform consistency. If you want the drink to be thicker, add 3-4 tablespoons of cornstarch or flour. Then it will resemble custard. To milk drinks can submit fried in milk with sugar, white bread. Here's another dessert in 5 minutes. - 2 tablespoons of sweet syrup. Bananas peel and chop the pulp using a blender. Add syrup, chilled milk and whisk. If you want the foam head was greater, prepare strawberry cocktail. - sugar to taste (2-4 tablespoons). 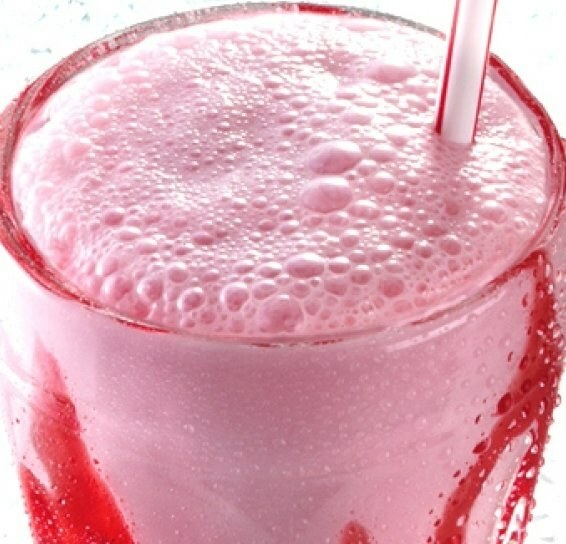 Strawberries put in a blender, pour it in 0.5 cups of milk and blend. Put a lot in more capacity, as it will produce a lot of foam. There add the remaining milk, sugar and whisk. This cocktail with chilled ingredients, you can even whip with a whisk. It will turn out delicious and airy. If you want a dessert to something more substantial, mix the flour, a little salt and water to make dough consistency, as for dumplings. Sprinkle the table, the rolling pin with flour and roll out the dough into a circle with a thickness of 0.1-0.2 mm. Now you can unleash the imagination. Slice it into strips. On the one hand each, using a sharp knife, make a fringe. Roll each strip into a roll and make a rosette. Scraps of dough can be cut into arbitrarily – diamonds, circles, shape of a flower. Now all these arts immerse in boiling sunflower oil for 1-2 minutes. As soon as the product is Golden brown immediately remove them, put on a dish and sprinkle with icing sugar. Delicious, nutritious desserts in five minutes ready.